I couldn’t not recommend a better bridal store to anyone! Bridal by Aubrey Rose made it such a memorable and fun experience! The ladies were so friendly and approachable from the moment we walked in and instantly made us feel like we were part of the family. There was such a vast selection of dresses to choose from in all styles and colours. I walked away feeling so confident and welcomed, even when we popped back (unexpectedly) just to try it on again and reaffirm our decision before saying yes, we were welcomed with open arms! Thank you Hayley and the team for helping me to find my dream dress! I can’t wait to pick it up and wear it on the day! Could not recommend Bridal by Aubrey Rose enough! From the first moment I stepped in the door the ladies were so kind and helpful and not pushy at all and made all my nerves go away! I had been following Aubrey Rose for a few years before I got engaged and always knew I would end up getting my wedding dress from there when the time would come, so many beautiful dresses to choose from Aubrey Rose was the first wedding dress shop I went to and ended up picking my dress that night and never went to another store. I couldn’t decide between 2 dresses and the girls were so patient with me and let me keep trying them back on to help me decide. My dress arrived when they said it would and the alterations lady they referred me too south of the river (Svitlana) was amazing and very well priced. When I picked up my wedding dress I also decided I wanted to get a veil and once again so helpful. Every time I stepped into the shop you were made to feel so welcome! I have nothing but absolutely positive things to say about Bridal By Aubrey Rose and the lovely ladies that work there! From the second I walked through the doors I was welcomed with the most positive and friendly atmosphere! Such a gorgeous little store with the most amazing selection of gorgeous gowns! The ladies were very knowledgeable and helpful and made the whole experience so relaxing and fun! Honoured to be a BBAR bride and so happy to support this amazing family business! I would recommend every future bride visit Bridal By Aubrey Rose it is an experience you wont find at any other store! The service, the dresses, the staff are absolutely above and beyond! I am so happy to have found my dream dress at your shop! Beautiful people at the most beautiful shop. You are all such a huge part of my wedding day and I cant wait to get into that dress! Thank you for having my family and myself in your store! (and keeping is hydrated when we walked to the shop from the station in 42 degrees) I LOVE BRIDAL BY AUBREY ROSE. I came to this store earlier in the year with my girlfriends for my dress appointment. Immediately the wonderful ladies here made us feel so comfortable and every single dress I tried on was absolutely stunning! I came back to the store this week by myself, to re-try on 'the dress'. I was so nervous being on my own and making such a huge decision, but Rachel was amazing and helped me through the appointment. You girls are all amazing and I can't thank you enough for helping me find my dress! No words can express how amazing these ladies, their store and the dresses are!! From the moment you walk in there is a warm, calm and inviting vibe! You are made to feel like the most important bride in the world! The girls listen carefully to everything you say and offer a world of advice! They have beautiful and very private change rooms and within minutes you feel like you have known the whole team like close friends! !I have purchased my wedding dress and cannot wait for its arrival. Thank you so much!! I just wanted to say a huge thank you to all the lovely ladies I have met at Aubrey rose ! From trying to buying, and then finally... today picking up my lovely dress. I couldn't be happier. You are all perfect for your job and go above and beyond. A special mention to the lovely Sarah who helped me pick my dress, you are so patient and honest. And the gorgeous Rachel who helped me finalise everything today as I finally picked up my dress. Your honest opinion and guidance was amazing. Thank you from the bottom of my heart !! I was so nervous to try on wedding dresses, I didn't believe I would find the most perfect dress that I would love in every single way. The girls at Bridal by Aubrey Rose got me out of my comfort zone and were so amazing, helpful and wonderful and made the experience so special for me, nothing was too hard for them and the vibe there is so fantastic. Thank you so much ladies for being so lovely, I cannot recommend this place enough for brides who are wanting a personal and amazing experience with absolutely stunning gowns! All the ladies at Aubrey Rose were just so incredibly welcoming and made me feel so at ease when choosing my dress! They really listened to what I wanted and how I felt! Not to mention they remembered me by name when I made an unexpected visit to look at the dress I eventually had chosen to be mine. I am so excited to wear my beautiful dress on my wedding day and can't thank you all enough for how special you have made me feel already! I tried many stores before aubrey rose. I was getting really worried and stressed because i couldn't find anything... i even went to a different state trying to find the one, but couldn't find the right dress. The bridal aubrey rose was my last hope and thank God i went there. The whole experience was amazing, the girls were so brilliant, they listened to me carefully, helped me in every way that i cant even explain. I just want say thank you so much for helping me, you guys made my day more special than ever! I love my dress sooo much. So glad I found my dress at Aubrey Rose, I had originally paid my deposit on a beautiful dress that was underway getting made, then unfortunately I had doubts and wanted to change, they did absolutely everything to help me & I have now found my definite yes!! So greatful to all the beautiful girls at Bridal by Aubrey Rose, couldn’t have done it without you! After visiting another dress shop, I was highly stressed and almost convinced I would never find something I would truly love. As soon as I entered Bridal by Aubrey Rose, I was given the time and space to browse through their collection of stunning dresses with the assurance that if I didn't love the top and the bottom, we could mix and match. Within half an hour, I was leaving the store, secure in the knowledge that I had found THE dress. I seriously recommend that any bride includes this store in their hunt for their perfect gown, you won't be disappointed! Buying my wedding dress from Bridal by Aubrey Rose was more like an experience than just a job that needed to be ticked off a list. The staff are so warm and friendly and they really make you feel special. 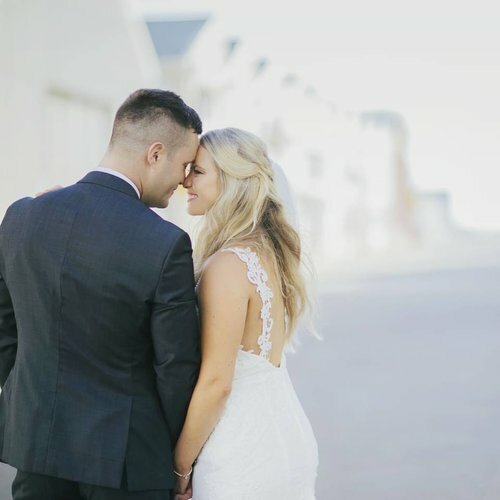 I also found them to be extremely knowledgeable- Hayley knew exactly what was going to work for me and she took a lot of interest in my personal style and used that to help me select THE dress. I was initially nervous about wedding dress shopping and this was very quickly turned into a relaxing and exciting morning at Bridal by Aubrey Rose! I had a not so positive experience at another bridal store - and after some badgering from friends and family decided to take the plunge & book in with Aubrey Rose. From the get go, the customer service was above and beyond. I was made to feel welcome, beautiful & personally cared for, the whole time. Thank you SO much to the ladies at BBAR & for making me feel amazing - I’m so excited to feel even more special on my wedding day! I will be sure to recommend your store to anyone else searching for their perfect dress! thank you again!! 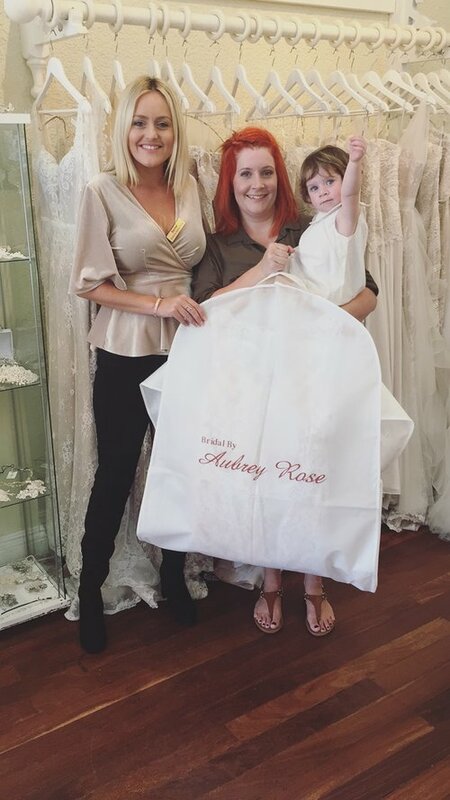 I really wanted to get my wedding dress from Aubrey Rose as they looked like such a friendly, family ran store - and I was so happy that I did! From the minute my mum and I walked in we felt so welcomed, Bethany was so attentive and made me feel really special. After I tried on the first dress I knew it was the one! We decided to have a look around other stores but nothing came close! We headed back to Aubrey Rose and even though it was nearly closing time nothing was too much trouble - I tried on my dress again and made the purchase! Thank you so much to all the ladies at Aubrey Rose - you are brilliant and I can’t wait to pick up my dress! This should be every brides first stop . The service here is second to none which is a must when making your dream dress purchase. Not only are the gowns amazing & the staff super friendly, they give great advice & make sure you leave with an amazing experience. Thanks so much ladies you went above & beyond. I love love my dress! I have been following BBAR for over 12months now and there has been one dress I thought I could only dream to have. I talked myself out of it before I got to the shop, ‘it’s too revealing for my body shape, I’m not slim enough, it would cost too much to make changes to it, to look good on me etc’ but today the ladies at BBAR called BS to all that negativity in my head an made all my dreams come true. Thank you so much ladies for the warm welcome to Mum and I...thank you for making me feel comfortable...thank you for turning my dream dress into a reality. I can’t wait to see the creation we came up with today. I’m beyond happy and grateful for what you did for me today. My wedding isn’t until next year, however with the recent sales I thought I would be a fool not to take up the offers. I entered Aubrey Rose with my Mum and Maid of Honour and from the moment I put my dress on I knew it was the one. My first ever wedding dress fitting and I already found the gown! As a woman who struggles with her weight I was cautious about what did and didn’t suit my body shape, however I was made to feel incredibly comfortable as the lovely ladies in Aubrey Rose cater for those bigger sizes, which not many bridal stores do. So thank you for making wedding dress shopping for myself so easy and enjoyable! I had only a few months until my wedding day and Rachel went above and beyond to help me find the perfect dress! I am extremely happy with the level of customer service I received and I absolutely love my dress! Thankyou so much for everything! Highly recommend this store!! Just wish I could rate them higher than 5 stars!! I came into your store last year in a panic as I'd had a major dress disaster and had to desperately find a new dress 10 days before my wedding. When I came in, without an appointment or anything, you squeezed me into a changeroom in the 20 minute time gap you had. You then gave me every available 'off the rack' dress you had to try on, and assured me you could have it altered in time. Although I didn't end up buying one of your dresses (I just couldn't do fishtail and strapless) I walked away with a memory of one of the best experiences in a bridal store I have ever had! Most other stores simply berated me for not being prepared (because I totally planned to have a dress disaster), while you were comforting, helpful, and totally wonderful. As both a bride and wedding industry photographer, I have already recommended your store to every bride I've met. Thank you so much for being so great! As per my message to the ladies at BBAR this morning, I just want to say a very big thank you to each and every one of you beautiful girls for all your help, care, excitement and love. From strangers to friends! Always get the most amazing feeling walking in and when leaving the shop! Thank you thank you thank you! I’m so In love with my dress and of course BBAR family!!! I would like to sincerely thank all you beautiful girls for making my dreams come true in my beautiful dress! I was not sure what I was looking for, when I started my journey looking for "my dress"! Hayley you were amazing help from start to finish, and my dress was completely different to what everyone thought I would go for but was me to a tee! I felt so beautiful in my dress & veil!!! Cannot wait to share photo's of our day with you all! Yesterday I picked up the final item I ordered from Aubrey Rose. I got a bit sad walking up to the shop knowing I wouldn't be coming back in. I can not wait to wear my dress, veil and headpiece in 4 months time. All the girls there are wonderful but a special thanks to Hayley, you are so lovely and you just made the experience even better. I had the most amazing experience in selecting my wedding dress at BBAR. The staff were so friendly and helpful from the initial booking of my appointment to the day I took my perfect dress home. Can't recommend this place enough!